Most people put in a lot of physical effort throughout spring and summer to keep their bodies fit and trim. Come Fall, many people put their sports gear away, wait for the holiday season and then put on weight. Then they struggle to get rid of their waistline for summer again. Just because it is Fall does not mean one cannot exercise. Fall is the perfect time to exercise- the weather is nice, the air is crisp and cool and the scenery is gorgeous. In addition, when you start to exercise in fall, it will carry you through to the holiday season and prevent you from gaining weight. So what types of exercises can you do in the Fall? Fall is the one season when you can walk, hike, bike and feel great. The cooler temperatures allow you to do more exercises without getting sweaty and tired. Almost everywhere in North America, the fall season brings out new scenery which can be enjoyed no matter which outdoor exercise you perform. If there is early snow in your area, then you may want to try snowshoeing or cross country skiing. Or if you live along the coast, take your dog and play a vigorous game of fetch or frisbee with the dog. The other reason why Fall is great at the beach is because there are no crowds. If you are near a lake, you may want to try canoeing or kayaking which gives an excellent whole body workout. If you hate going to the beach or the water, rake the leaves or perform some outdoor yard work. These two activities can get your heart rate moving and burn your calories. To take the monotony away you can also do some type of weight training in your basement. Fall is also the time when gyms starts to offer dancing classes, karate or judo lessons, yoga, meditation or aerobics. So look around and pick an exercise that excites you. With the kids in schools, you can have the entire morning or afternoon to do some type of exercise. Change your lifestyle. Fall is the one time when you can set the pace for the year. So incorporate some type of exercise into your lifestyle. Walk more at every opportunity. 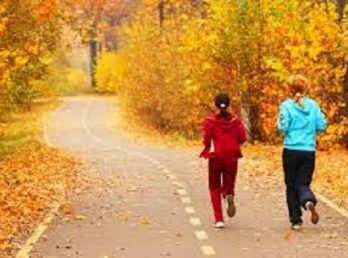 Remember if you start out with an exercise in the Fall, you will just be starting to burn a few calories. However, by the time spring comes, you will be a pro at the physical activity and burn more calories just in time to fit into your summer bathing suit. Fall is the perfect time to rejuvenate yourself. Try enhancing your mind and spirit. After physical activity get a massage, learn to meditate and relax and promote wellness of your body. However, Fall is the time when it is cooler outside so do not fall into the trap of getting more sleep when at home. Get up and do something for your body. While the initial few weeks may be tough but once you develop a rhythm, it will be fun and exciting. Exercise is all about commitment and consistency. Do remember Fall is the time of the year when it is darker outside- so be smart and safe. Wear a reflective vest and work out at the same time everyday so that you get used to the traffic. Do dress appropriately when exercising in Fall. Finally set some goals as this will give you some motivation. The goal is not only to lose weight and keep trim but also to enjoy exercise and make it part of your lifestyle. Create challenges regularly and do an exercise that you like; so that you will keep on doing it. Remember if you want something bad, you will need to work for it.